The new, very different replacement for Theophany’s semi-legendary M5 floorstander proves to be a better speaker in (almost) every way that counts. YOU GET TO hear a lot of great gear when you’re reviewing hi-fi, but seldom get your head blown off (figuratively speaking, of course). That’s what happened when I first heard Theophany Loudspeakers at the Auckland Home Show in 2006, and the love affair has sailed along, unabated, ever since. 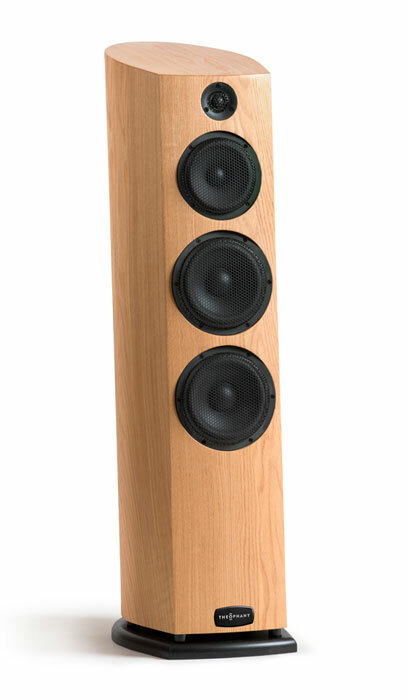 The Theophany’s proved so impressive that a pair of the then flagship M5 Series 2 floorstanders made their way into my system in 2007, and despite a veritable flood of potential replacements crossing my path over the years, nothing in the sub-ten thousand dollar range made a serious bid for my loyalty. The chief designer at Christchurch-based Theophany is Garth Murray. I’ve spent many hours discussing speaker design and music reproduction with Garth since 2006 and if I’ve learned anything, it’s that Garth is an inveterate experimenter. He’s never content to rest on his laurels and is always looking for the next improvement, be it a dramatic change or a small tweak that leads to a tiny enhancement in sound quality. So the top of the range M5 model benefited from a number of changes over the years, before eventually being superseded by a model from an entirely new range of speakers. The Psuche Kardia being reviewed here is no longer the flagship; that place is reserved for the $15,000 Rhapsody model, but at $6500 the Psuche Kardia is said to offer more than the M5 ever did. Placed side-by-side, the M5 and the Psuche Kardia may look similar but everything has changed, and much of this review will inevitably contrast the old with the new as the question of replacing my M5’s rears its ugly head. The most notable change is the top panel, which is now bereft of the upward- firing driver that was once a Theophany signature. The glass fibre drivers are long gone, replaced by a new range of coated paper units. These are no mere off- the-rack drivers; instead they’ve been custom designed and manufactured in Europe for Theophany. There’s now a single 5-inch midrange unit and two 6-inch units have replaced the dual 5-inch woofers. The new 22mm silk dome tweeter is a rather special unit that runs totally flat to 22kHz but extends to well over 40kHz at -3dB. The specifications of the woofers are very carefully matched to their chamber, allowing Garth to coax the lowest possible frequency from the speaker. They’re also designed for lightweight and maximum efficiency, which makes them faster and easier to drive than the old drivers. The old glass fibre drivers were tough as nails, so grilles were never part of the Theophany plan, but with the move to the paper drivers and a strong presence in the Harvey Norman chain (and its inescapable hordes of poking fingers), individual perforated, rugged metal grilles are now sited in front of each driver. According to Garth, these grilles are so acoustically transparent that his measuring equipment can’t pick the difference between grilles on or grilles off, but in any event, they can be removed with a little effort, so purists needn’t worry. The curved cabinets seem to be similar to the older models, but there have been external and internal changes to reflect the performance improvements offered by the new drivers. The top two drivers are housed in a sealed chamber, while the woofers run in a bottom-ported 40-litre chamber that exits above a wide base, giving the speakers a large degree of stability. The Psuche Kardia is both shorter and narrower than the old M5, with a shape and construction that goes even further to eliminate standing waves. Theophany speakers have always been less resonant than equivalently priced, conventionally shaped rectangular models but the taller M5 cabinet seems to be noticeably more solid, particularly along that top panel. The old panel has a hole cut in the middle with a driver hanging in it, which makes for a smaller area to resonate – thump it hard as you like and it sounds (and feels) like a chunk of tree. The Psuche Kardia’s top panel and the top part of the cabinet reverberates a little more but Garth reckons that losing the upward firing driver is a good thing, with improvements to the imaging and soundstage width and depth. Garth has paid particular attention to the crossover design in the new models. As he put it: “For each speaker, we modelled five or six options and then played with them. Some crossovers gave a flat response but because of phase shift and transient changes sounded lifeless. We found several we liked that gave good results on the test bed but also provided good listening results, which in my opinion is more important. When we had done this we decided to replicate each of the crossovers to three different standards. In the first we used air core inductors and polypropylene capacitors for the tweeter and with iron core inductors for both woofer stages as well as ceramic capacitors and some other cheaper options. We also made one with the air core inductors and polypropylene capacitors in the tweeter and mid-woofer stage and cheaper caps and inductors in the woofer stage where it is not so critical. We also made a pair that were entirely air core inductors, polypropylene capacitors and even wire wound resistors. This last being up to twelve times more expensive than the first. When we did our testing we found that the difference between the three was enough to justify building the better one so we went with the most expensive.” I’ve seen this crossover and it’s a big, heavy unit mounted on a serious chunk of PC board, with substantial components and Theophany’s own specially sourced silver plated copper cable. Nothing has been left to chance on these speakers, which is something of a unique approach at the price, so in addition to custom drivers, imported and local veneers and custom internal cables, even the woodscrews used to mount the drivers have been specifically designed. The standard screws weren’t allowing sufficient torque to be applied before stripping the wood thread, so Garth came up with his own design and ordered them in massive quantities to make sure that he has no issues with supply. Build quality is better than the previous range, and the new binding post plate is a long way ahead of the old binding posts, which just poked out of the back of the earlier models. The American Red Oak finish grew on me during the review but it’s hard to beat the gloss Rimu of my M5’s (gloss is an extra cost option these days). A wide variety of veneers are available, along with a huge selection of custom colours in a new translucent painted finish – the green shade looks amazing. After around eighteen hours of running in, mostly using Pandora on an iPhone as a source with the humble (but superb) little Rotel RA-11 integrated amp (reviewed here) and a random assortment of copper cables, I moved upmarket. My Viganoni and Viganoni Sachem three-box power amps and StereoKnight Silverstone Balance passive preamp were hooked up to the Psuche Kardia’s with a Marantz SA8260 SACD player as a source. Cables were Slinkylinks cryogenically treated silver interconnects and an old set of single wired copper Monster M Series between amp and speakers. Through the Rotel amp, the sound of the Psuche Kardia’s had been impressive but I was still firmly in “running in” mode, so I hadn’t been listening all that critically; instead I’d just been enjoying the music. However, when I hit play on the Marantz remote, choosing one of my favourite songs of the moment – ‘Lie In Our Graves’ from Dave Matthews And Tim Reynolds Live At Radio City, as the music poured into the room it took only a moment to realise that I might just be in the presence of something special. But the running-in road has been traversed on many occasions, not least of all with my own M5’s, which needed two hundred hours and a sound thrashing to really come on song, so the Psuche Kardia’s were left to break in for another 30 hours or so before more serious listening ensued. They were sounding better, more open and with slightly deeper bass, but rather than wait for ages I decided to try giving them the aforementioned beating. They were wired out of phase, facing each other with the bases touching. A pillow from the couch was wedged between the tweeter and midrange and a duvet hurled over the pair. It’s amazing how well this bizarre set up cancels out sound, particularly the neighbour-offending bass notes. The Psuche Kardia’s were run at high levels for an hour or so with the Sachem power amps even getting hot in the process – these original models operate at low bias and usually run ice cold. After this, I used a trick Garth had suggested and ran a 31Hz signal from an iPhone tone generator into the speakers for about 15 minutes, again at scarily high levels. After around 100 hours of listening plus the loud volume stuff, the Psuche Kardia’s were sounding as if they’d gotten over their initial reticence and were ready for some concentrated note-taking sessions. As good as the speakers sounded at this point, it became readily apparent as the test continued that the run-in period can only be hurried along up to a point. Even though the out-of- phase and tone generator workout helped, it took another two weeks of regular use for the Psuche Kardias to really loosen up – I’d speculate that this is more due to the size of the crossover components than the drivers (and Garth agrees) but whatever the reason, without the extra playing time, this would have been a review of a very good set of speakers. With a couple of hundred hours behind them, this is instead a review of a great pair of speakers. It’s too easy to say the Psuche Kardia’s opened up during the run-in period. They never really sounded constrained, there’s much more to it than that – guitar strings developed the bite that I get from my old M5’s, drums and bass guitars became more powerful with the sense of impact that’s a combination of both bass weight and speed. Vocals became more nuanced and micro-detailing more pronounced – effectively, the speakers just flat out improved in every area. The new models not only matched the old version in most critical sonic areas but generally they extended the strengths to new levels. The M5’s always impressed with their detail levels. They’ve got a wonderful ability to cut through to the intricacies of a recording, and no review speakers at sensible money have ever made me feel that they were lacking in this regard. Even such luminaries as ATC’s SCM20SL AT active speakers (reviewed here), the DeVore Fidelity Gibbon 88’s (reviewed here) or the Living Voice Avatar II’s (reviewed here) – which are all about as high resolution as anyone could desire at their price points – never outshone the M5’s to any huge degree in this respect. However, the transparency of the Psuche Kardia’s definitely made the older model from Theophany sound a touch veiled through the midrange and into the treble, which begs the question of how they’d compare to the speakers mentioned above. This new tweeter is an exceptional unit, and its contribution to the way notes decay in the background, and to the air around the playback can’t be overstated. To say that this improvement over the old model was disconcerting is a major understatement, but it became a familiar feeling as the review progressed. Listening to the guitars on recordings such as Nils Lofgren’s Acoustic Live or the aforementioned Dave Matthews/Tim Reynolds CD was like listening through a set of good headphones – these speakers are capable of conveying subtlety like nothing I’ve heard at the price. They carry the same resolving capability into the way they deal with vocals and other instruments, and they’re especially adept at exposing the detail often hidden in bass notes. The bass guitars on SMV’s ‘Thunder’ from the Thunder CD sounded powerful and huge, filling the room with sound, yet the feeling of actual strings moving air was enhanced over what I was used to. The strummed guitars on ‘Still Water’ and ‘Don’t Drink The Water’ from the Matthews/Reynolds CD had a massive resonance at high levels that would have many looking for a hidden subwoofer. The 6-inch woofers push the low frequency extension down to levels that will satisfy most bass enthusiasts short of the “must have two subwoofer” types – there’s now substantial energy in the room at 30Hz. The Psuche Kardia’s carry more weight than the M5’s, giving the big, low bass on Massive Attack’s ‘Karmacoma’ from Protection a throbbing weight that the M5’s can’t match. Then again, bass isn’t all about outright extension – according to Garth, the M5’s have a moderate bass peak in the 40-60Hz range; nothing too dramatic but it’s there and it adds to the sense of power and scale that’s always been a strong suit of these speakers. Still, like all Theophany speakers, the Psuche Kardia’s are a work in progress and their excellent bass quality has apparently been further enhanced since the review after Garth figured out a way to eke an extra 4Hz from the bottom end and to add in some more punch at the 40Hz level by tweaking the internals of the bottom chamber. The Psuche Kardia’s are unquestionably a more accurate speaker than the M5’s, with a flatter, more linear frequency response that reaches down further and a nicely judged overall sonic balance. They’re faster too, and they can be thunderous, but when pushed hard the M5’s rip and tear into the room with a scarcely contained ferocity that the new models can’t match (I’m convinced that this has something to do with four drivers working in the upper bass region). Along with their overall dynamics, this is probably the characteristic that has most endeared the M5’s to me, and the one that I’ve found hardest to replicate with other speakers. Yes, it’s an artifice but it’s one that I loved when I first heard it, and it’s what I’d miss most were I to replace these speakers. A consequence of the M5’s bass peak, along with the tuning of the speakers is that they’re richer than the more neutral Psuche Kardia’s. I’ve never considered the M5’s to be warm but switching from the old to the new was like turning a subtle tone control on and off. That said, the Psuche Kardia’s are by no means lean or bright – it’d be hard to imagine applying those terms to any aspect of their sonic performance. Best to say that they’re just exceptionally accurate, easily showing off minute differences in sources, amplifiers and cables, yet suiting everything that was slotted into the signal chain while they were in for review. Like most revealing speakers, they’ll show up any limitations in a recording. Take one of my favourite new songs for example – ‘War Song’ from OAR’s Live On Red Rocks double CD. The starkness of the horns and cymbals is aggressive enough through less illuminating speakers (and amplification for that matter) but through the Psuche Kardia’s, I couldn’t take this track at high levels and had to hit the skip button, much to my dismay. The same applied to the brightly mixed AWOLNation’s ‘Sail’ from Megalithic Symphony – it was just too intense at higher levels. This isn’t due to a rise in treble output because at normal levels these songs are fine, rather it’s the result of a specific part of the speaker tuning. After a decade in the speaker game, and with plenty of feedback from Theophany speaker owners, Garth has realised that the vast majority of his customers listen to their hi-fi or home theatre systems at around 80dB, with infrequent excursions into louder territory. So the entire speaker range is voiced to perform best at around 80dB. This may sound like a strange concept – surely a speaker just works regardless of how loud it’s played – but according to Garth, it’s a case of dialling in the available detail levels. He can make a set of speakers sound “right” at 100dB, but then they’d be a bit subdued at 80db. The Psuche Kardia’s do start getting a little intense at volume levels reaching 100dB and more, especially at the top end and with recordings that are fierce to start with, but they’re spot on at 70-90dB, which funnily enough is where most of my listening happens. For every short-lived, exuberant, neighbour-bashing session, there are many sessions where the volume knobs on the StereoKnight are firmly pointed below three o’clock, with levels running at 75dB or so, so this approach makes a lot of sense when seen in context. One aspect of the Psuche Kardia’s performance that didn’t improve to a major degree despite the long run-in period was the soundstaging. The sweet spot was initially laser-thin and the speakers weren’t disappearing into the acoustic as all the Theophany speakers that had crossed my path had. Even my M5’s, while not the kings of imaging precision, totally vanish – there’s no sense that the sound is actually emanating from the speakers themselves. Much of the review was done with the Psuche Kardia’s wired up with the single wired Monster cable with the same cable used as jumpers between the binding posts. This configuration gave me the best results on the M5’s since I had to get rid of the Nordost Blue Heaven (this wide cable didn’t like the Neutrik connectors on the power amps). However, I had a couple of short lengths of a very high-quality French cable of uncertain brand that I’d picked up along with the amps years ago. Given that this cable was already set up with Neutrik connectors at the amp ends and good quality silver plated banana plugs at the bi-wired speaker ends, it made sense to give it a shot. It took a few minutes to shift the amps around and remove the jumpers and then all was good to go. This change led to something of an upgrade in the imaging, specifically in the solidity of the image and the separation of artists and instruments, as did a move to longer bi-wired runs of Nordost 2 Flat speaker cable as recommended by the designer of my amps. However, the Psuche Kardia’s never really approached the impressiveness of the M5’s vanishing act, nor did their imaging ever reach the levels expected regardless of the source or amplification involved. This likely has something to do with the new crossover design because the cabinet and driver layout would seem to lend themselves to good imaging and soundstaging. The designer will see it as an acceptable trade-off for the other benefits, of which there are many. The Psuche Kardia’s are still exceptional speakers, they just don’t image as well as many of the competitors. You can of course buy speakers that will place an image with the solidity of a marble statue in a museum if that’s your thing. 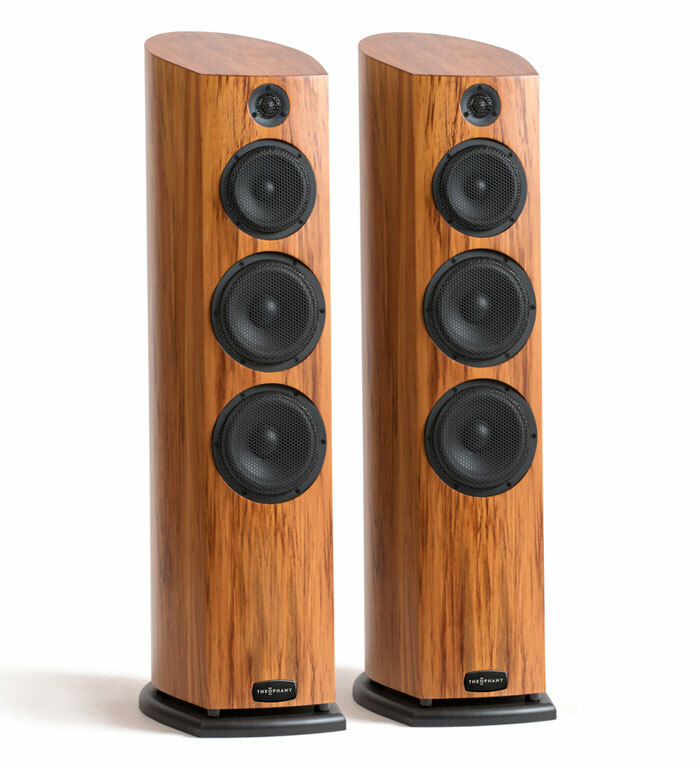 A brief listen to the new Pnuema Kardia floorstanders, which at $5500 sit below the Psuche Kardia’s, showed that they’re better at imaging than the more expensive model. So, that might be an option for those who want some of their mini-monitor cake in a big-sounding Theophany floorstander. It’s critical to note that these speakers will improve considerably over time. Unlike the DeVore Fidelity Gibbons and the Focal Chorus 816V speakers, which changed relatively quickly, the improvement here is slow. If you like the way a brand new or newish set sounds on the showroom floor, then you’re likely to love a fully run-in pair. They’re unquestionably a superior speaker than the M5’s, but am I going to replace my speakers with the new model? Not at this stage. The taller M5’s with their upward-firing drivers have a visual presence that the shorter Psuche Kardia’s lack. That alone is nowhere near enough to justify them sticking around, but the way the M5’s play some of my favourite music is sufficient, at least for the moment. Eventually, I’ll get a set of the Rhapsody flagships in for a review to see if the law of diminishing returns can be subdued for long enough to rationalise the purchase of a much more expensive set of speakers. The old M5’s were always relatively easy to drive, but the Psuche Kardia’s are quite a bit more sensitive, making them a good match for any number of high quality amplifiers, and according to Garth, they’re much happier with low damping factor valve amps than the earlier models. It’s worth noting that owners should feel entirely comfortable matching these speakers with excellent sources and amplifiers, not to mention good bi-wired speaker cable. After all, I’m 100 percent happy comparing them to any speakers I’ve ever heard for less than $10,000, exactly as I was (and still am) with the M5 Series 2 model, which was the best of the previous Theophany models. As the last paragraph implies, the Psuche Kardia’s do most things very well indeed. As an example of the speaker maker’s art, they’re remarkable, even more so considering that they’re handmade in little old New Zealand, which has to count for something. They look great and they sound even better than they look – presenting an unvarnished representation of the musical truth and a very high-end, yet approachable sound. They don’t impose their own character on the music, and the clarity, detail and overall quality on offer here is worth every penny of the price. Most impressive of all is the fact that Garth and his team have created a better speaker than the old range topper, and it costs $500 less than the equivalent did six years ago!